Clients in need of a short-term cash influx may be tempted to dip into their IRAs and repay themselves rather than seeking out a lender. 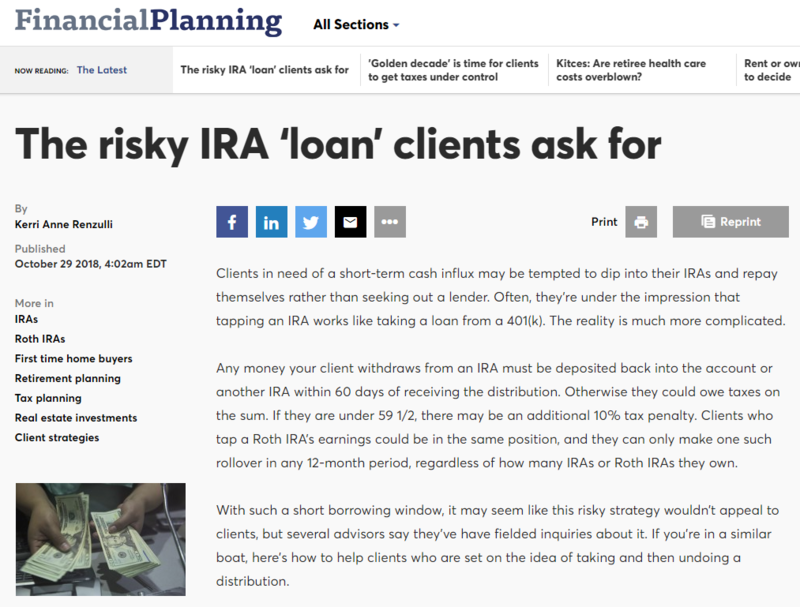 Often, they’re under the impression that tapping an IRA works like taking a loan from a 401(k). The reality is much more complicated. Any money your client withdraws from an IRA must be deposited back into the account or another IRA within 60 days of receiving the distribution. Otherwise they could owe taxes on the sum. If they are under 59 1/2, there may be an additional 10% tax penalty. Clients who tap a Roth IRA’s earnings could be in the same position, and they can only make one such rollover in any 12-month period, regardless of how many IRAs or Roth IRAs they own. With such a short borrowing window, it may seem like this risky strategy wouldn’t appeal to clients, but several advisors say they’ve have fielded inquiries about it. If you’re in a similar boat, here’s how to help clients who are set on the idea of taking and then undoing a distribution.